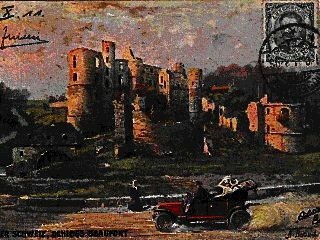 The dates for used postcards have been determined by the postmark, which usually appears on the reverse (non-picture) side. 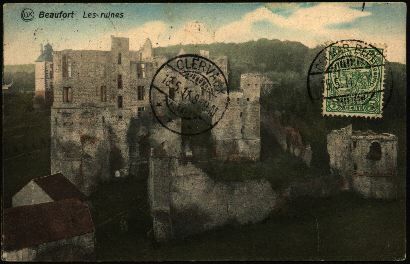 Dates for unused postcards are estimates only. 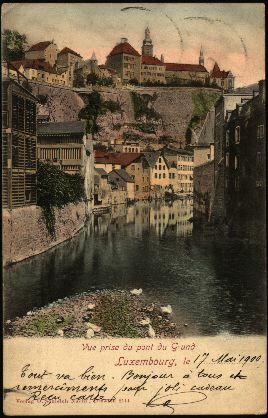 View of the Upper City from the Grund -- 1900. 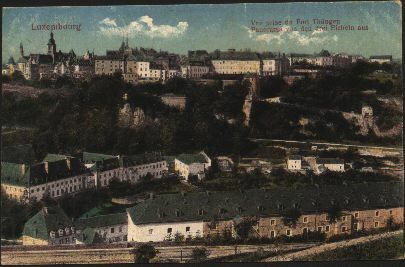 View of the Upper City from the Grund -- 1918. 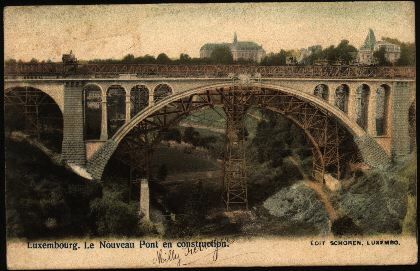 Adolphe Bridge under construction -- 1902. 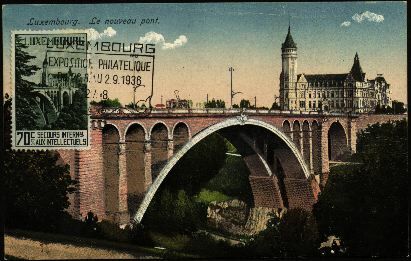 Adolphe Bridge and State Savings Bank -- 1936. 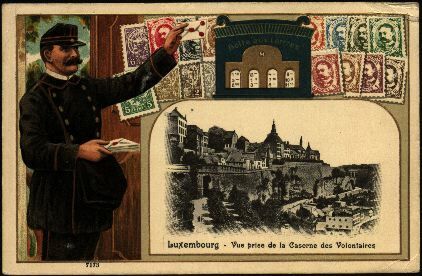 View of the Upper Town of Luxembourg and drawing of postman, postbox, and Luxembourg postage stamps -- 1912. 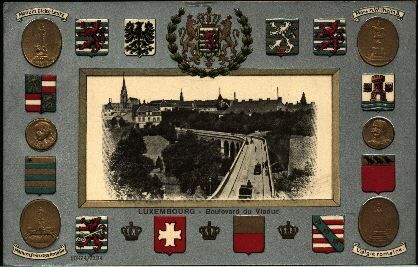 The Viaduct Boulevard (Passerelle) and drawings of the coats-of-arms of the 12 cantons and medallions depicting four monuments and Grand Duke Guillaume IV and Grand Duchess Marie-Anne -- 1912. 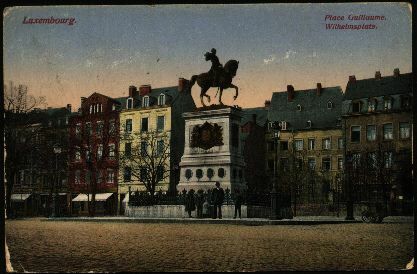 Place Guillaume II -- 1918. 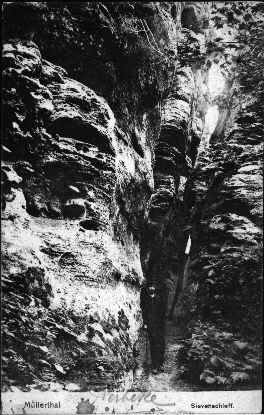 The Hollow Tooth ruin on the Montée de Clausen -- 1918. 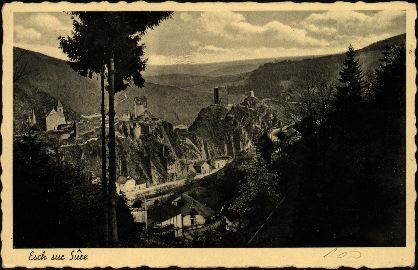 The Three Towers and a view of the suburbs of Clausen and Pfaffenthal -- 1918. 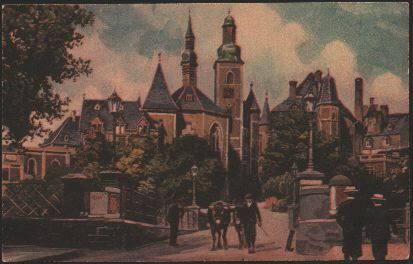 St. Michel's Church -- 1919. 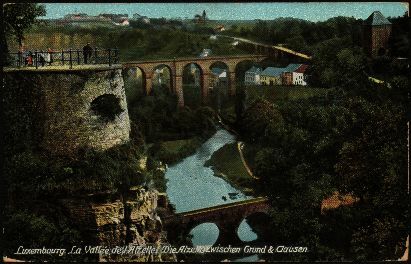 Alzette River Valley below the Bock -- 1920. 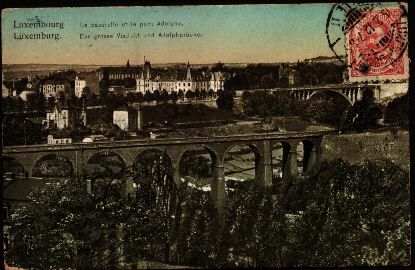 Castle Bridge and St. Jean's Church in the Grund -- 1920. 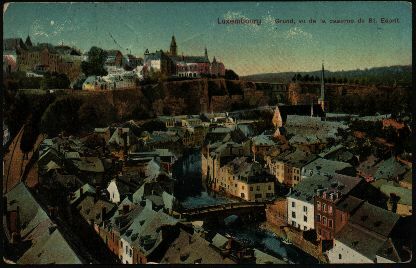 View of Luxembourg from Fort Thüngen -- 1923. 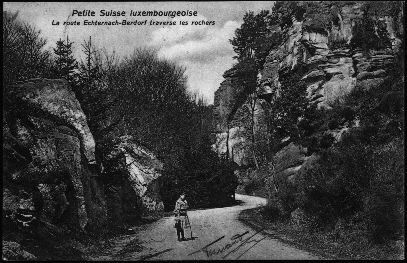 The Echternach-Berdorf road through the rocks -- 1911. 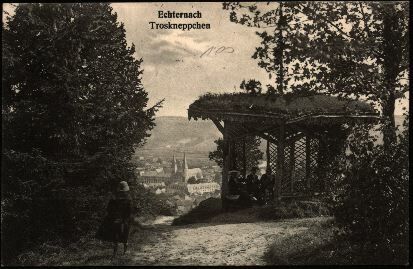 The gazebo in the hills overlooking Echternach -- 1916. 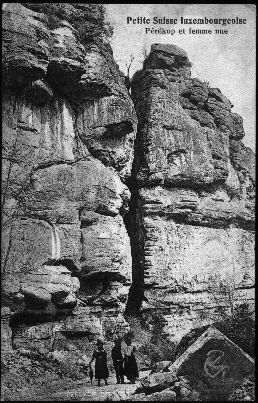 Pérékop and Naked Woman monument -- 1919. 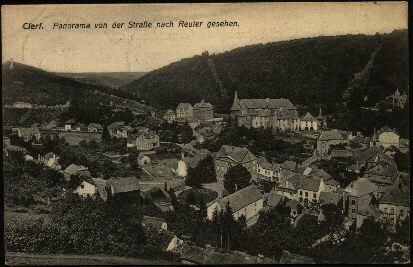 A view of the town from above -- 1909. 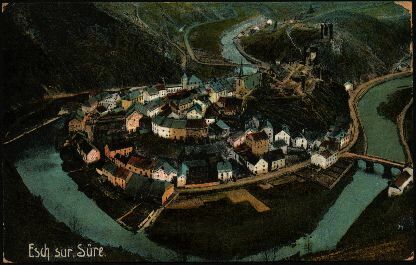 A view from above showing the town nestled in a tight loop of the Sûre River -- 1929. 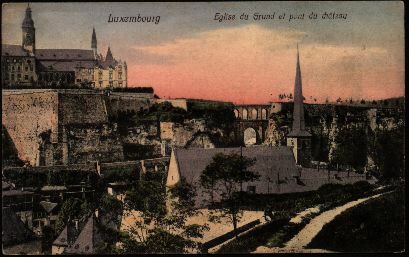 A view of the town -- 1938. 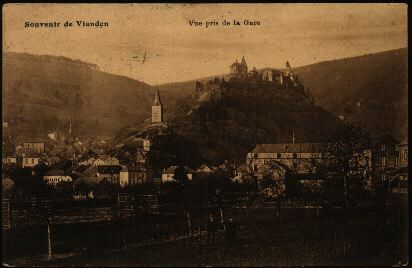 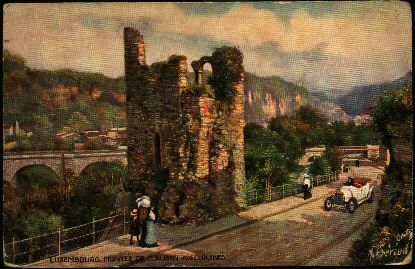 A view of the ancient Vianden Castle -- 1907. 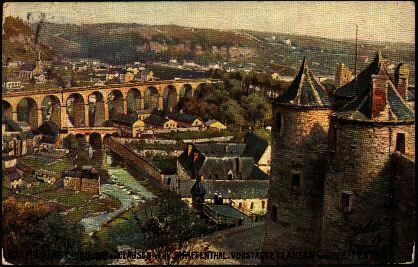 Be sure to also visit Solange Coussement's web site on Old Postcards from the Grand Duchy. 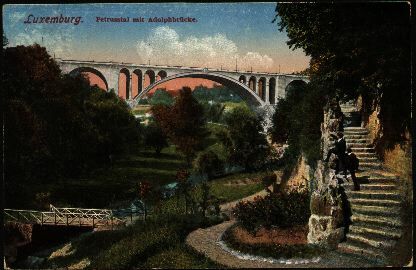 Last updated on January 30, 2005.